Monday – 13th August 1977: Hundreds of protesters clash with police at a National Front march in Lewisham. About 400 Socialist Worker Party members had gathered to try to prevent the National Front march, but had been prevented by police, leading to attacks on the police themselves and over 200 arrests. Tuesday – 14th August 1821: The funeral procession of Queen Caroline, wife of George IV, makes its way through London en-route to Harwich and a ship that would carry her body to Germany for burial. The originally prescribed route had deliberately avoided central London, but huge numbers of demonstrators had blocked all other viable routes and forced the procession to travel through the City. During the subsequent disturbances and rioting as crowds attempt to re-route the procession, many soldiers and civilians are hurt, and two are killed. Wednesday – 15th August 1950: Princess Elizabeth (as she was known at the time) gives birth to her second child, Anne Elizabeth Alice Louise (Princess Anne, who would become the Princess Royal) at Clarence House in central London. Thursday – 16th August 2001: Princess Diana’s former butler, Paul Burrell, is charged with theft from her estate at West End Central police station. Amidst some controversy, the subsequent trial would later collapse as the Queen recalls a conversation suggesting that Burrell was merely ‘storing’ Princess Diana’s belongings. Friday – 17th August 1896: A woman named Bridget Driscoll becomes what is reported to be the first ever pedestrian to be killed by a motorcar, in Crystal Palace, south-east London. Witnesses later describe the car as travelling at “a reckless pace” when it hit Mrs Driscoll. It would later transpire that the car was probably travelling at about 4 mph. 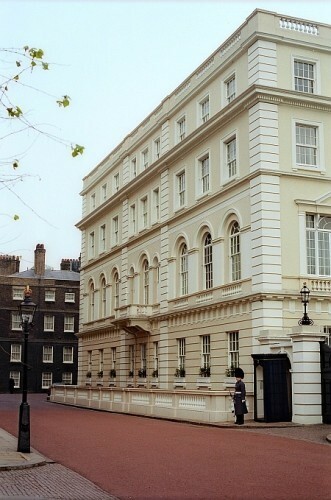 Picture of Clarence House from 1987 by EUROVIZION via the Londonist Flickr Pool.